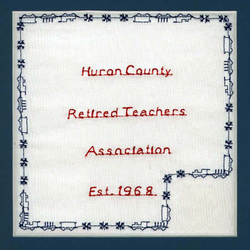 The Huron County Retired Teachers Association was organized on February 17, 1968 at the Huron County Education Department in New London OH. The chapter's purpose was to educate, to entertain and to serve. The 35 chapter charter members met at the Senior Center in Norwalk OH under the leadership of Thelma Toby. Ms. Toby was elected president with Kenneth Weaver as vice-president and Margaret Weaver as secretary. Meetings were held on the second Thursday of February, May, August and November. By 1973 the membership had grown to 65 members. In 1996 the membership was 114 and in 2007 it was 138. The HCRTA now meets on the second Thursday in March, May, October and December. Most of the time the meetings are held in churches alternating in the various communities in Huron County which include Norwalk, New London, Willard, North Fairfield and Greenwich. A scholarship fund was established to provide scholarships to any high school senior or anyone in the county enrolled in a teacher education program. Different members wrote histories of each school district in Huron County and they were compiled into a book on the History of Huron County Schools. The proceeds of the books that were sold were put into the scholarship fund. Members of HCRTA are involved in many kinds of volunteer work.